During the years between 300 B.C.E. and 400 C.E., peoples in a western region of Mexico lived in small, economically successful communities in a land of abundant natural resources. In these communities-now the modern Mexican states of Colima, Jalisco, and Nayarit-family lineage was important and burial sites were often conjoined to hold numerous relatives. Ceramic objects were also buried to testify to the family's wealth; some of these were large three-dimensional human figures. These compelling figural sculptures are the focus of this book. 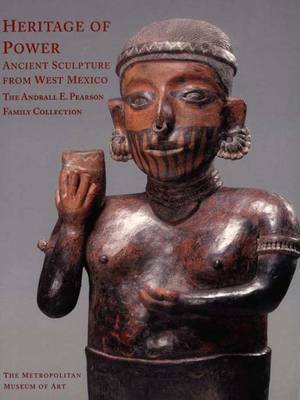 Heritage of Power features forty sculptures from the three major stylistic areas of West Mexican ceramic sculpture, each named for one of the modern Mexican states. While there are similarities among them (all areas produced Ancestor Pairs, for example), there are also interesting differences: representations of ballplayers and warriors were more common in Jalisco, and depictions of animals and birds were chiefly made in Colima. This, and much more, is explored in this beautifully illustrated volume. Forty compelling sculptures made during the years between 300 B.C.E. and 400 C.E. in three major stylistic areas of West Mexico are the focus of this fascinating book, which discusses the works and explores their connections and distinctions.